ARE YOU A CLOWN OR A MAGICIAN? The puzzles can be challenging and are designed to test adults. If your party will have children under the age of 13 we recommend checking out Fun House-KIDS! ABOUT – Come one, come all! Step right up and see if you have what it takes to become a magnificent magician! In this room filled with trickery and illusions, you and your team will be put to the test. Work to beat the clock as you search for clues and solve mind-boggling puzzles in a topsy-turvy experience of a lifetime! Now all you need to do is ask yourself, do you have the wits of a magician? Or are you as clueless as a clown? DIFFICULTY – Medium. 40% escape rate. # OF PLAYERS – 4-8 players. This game is PRIVATE- we will not group you with strangers. AGES – The Fun House is open to all ages. Anyone under the age of 13 must be accompanied by an adult age 18+. The puzzles can be challenging and are designed to test adults. 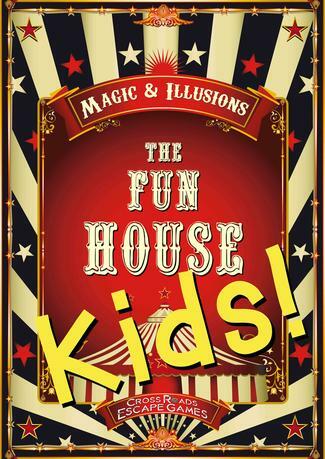 If your party will have children under the age of 13 we recommend checking out Fun House KIDS! below. For those under the age of 18 please have a parent/ guardian fill out a waiver before you arrive. Waivers can be found at the bottom of the FAQ Page. NEW! THE FUN HOUSE- KIDS! Request our new kid version of The Fun House so you can enjoy escape games with the whole family! Appropriate for all ages, but recommended for ages 8-13, this alternative version allows children 13 and under to participate more inside the game. After purchasing online, please call us at (714) 572-1004 with your booking date and time and we will make sure it is set for KIDS! Perfect for your child’s next Birthday Party or fun family night out! If anyone under the age of 13 is participating, at least one adult (ages 18+) must present inside the game. For those under the age of 18 please have a parent/ guardian fill out a waiver before you arrive. Waivers can be found at the bottom of the FAQ page. Our original Fun House is still open and available for adults.